Once you consider the usual suspects like chocolate and pecans and cream cheese, one of my favorite baking components is browned butter. I am relatively new to baking with browned butter, and I admit that I am deeply saddened at all the time I missed baking with it. But, I seem to be making up for lost time with plenty of browned butter treats. So, a few days ago when I was trying to think of a quick dessert we could enjoy this week, my mind went directly to browned butter. I also had a hankering for cake, so here we are. 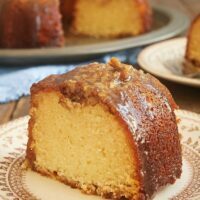 The cake itself is a version of a sour cream cake that I use as a starting point for a lot of cake recipes. 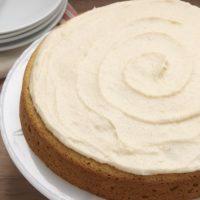 I bumped up the vanilla for a bigger flavor in a simple cake. Then, I topped it all of with a basic icing that I plied with browned butter and even more vanilla. The total package is a delicious cake whose flavors are somehow both understated and complex. As delicious as this cake is, and believe me it is fabulous, I may be most taken with the appearance of the icing. Look at all those specks! Straining browned butter is a preference thing. I usually don’t strain it, but rather control how much of the browned specks stay with the butter as I pour it out of the saucepan. In addition to those lovely specks, there are vanilla bean specks, too. All of that makes for one beautiful icing. I have a great love for simple, one-layer cakes. They’re essentially fail-proof. Plus, they’re a good option for a cake to serve a smaller number of people. If you’d like a big, tall cake, this recipe can easily be doubled to make a two-layer cake. Preheat oven to 350°. Grease and flour a 9-inch round cake pan. Using an electric mixer on medium speed, beat butter and brown sugar until light and fluffy. Add eggs, one at a time, mixing well after each addition. Mix in vanilla beans. Reduce mixer speed to low. Add flour mixture in 3 portions, alternating with sour cream. Begin and end with flour mixture. Mix just until combined. Transfer to prepared pan and smooth evenly. Bake 30-35 minutes, or until a pick inserted into the center comes out clean. Cool in pan on wire rack for 10 minutes. Then, remove cake from pan to a wire rack to cool completely. Place butter in a medium heavy saucepan over medium heat. Cook butter until melted. Continue cooking, whisking often to prevent burning. Butter will begin to foam. Brown specks will begin to form at the bottom of the pan, and the butter will have a nutty aroma. Remove from heat. Transfer butter to a large heatproof bowl to cool to room temperature. Add 2 tablespoons of milk and vanilla beans to cooled butter. Add about 1/4 cup of confectioners’ sugar. Beat mixture until blended. Gradually add remaining confectioners’ sugar and mix until blended and smooth. If necessary, add more milk, 1 tablespoon at a time, and mix until icing is desired consistency. Spread icing over the top of cooled cake. Serve immediately or refrigerate until ready to serve. If refrigerating, allow to sit at room temperature for about 30 minutes before serving. Brown butter is my best friiiiend! Hooray!!! This cake seriously looks amazing! 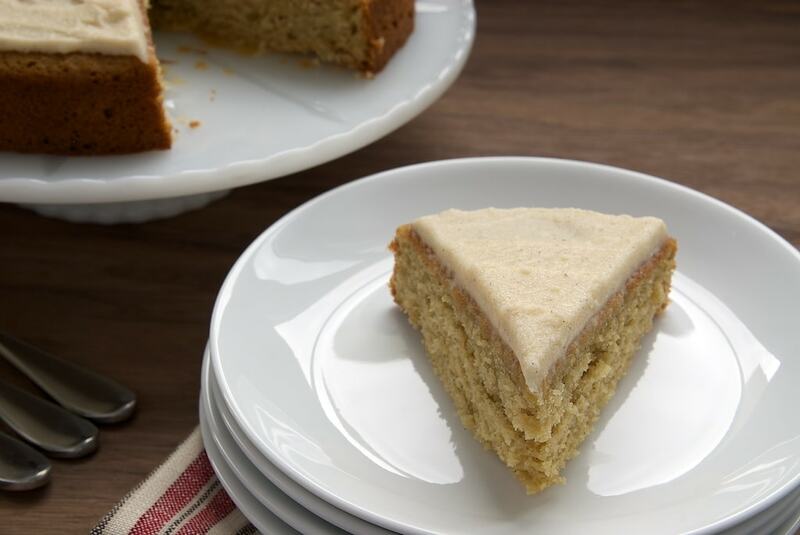 This cake sounds light and full of flavor with that browned butter and vanilla! This sounds just lovely! Browned butter is pure deliciousness! I love browned butter too! No, turning back! 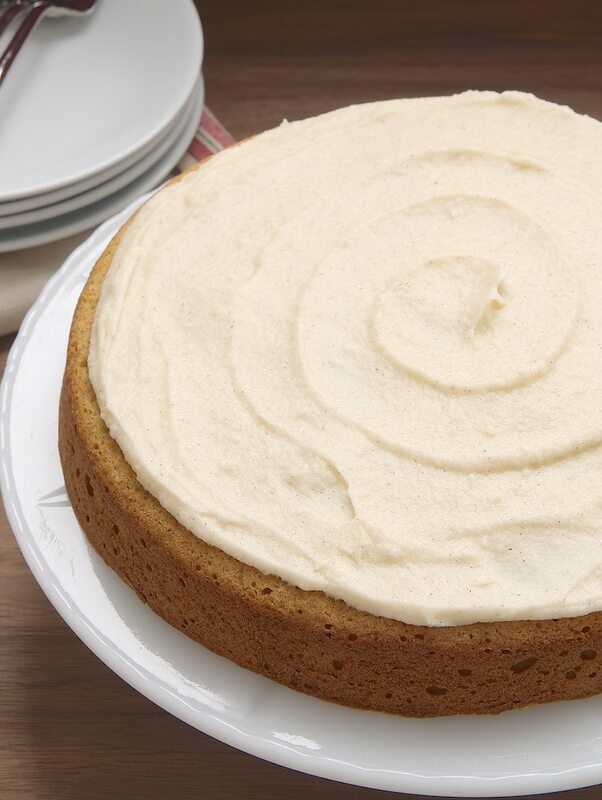 Love the simplicity of this vanilla cake! I need to try browned butter! This cake looks beautiful and simple! Such a classic cake! Looks lovely! This frosting sounds amazing…. It also looks so easy to spread!! Beautiful! Simple is always always one of my specs. 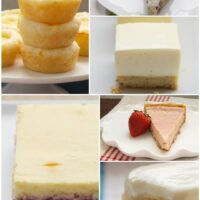 Love how you made the cake in a round one layer pan & cut in pie shape for serving…. I would probably have done the old boring square pan… Thanks for the idea! I had almost forgotten the beauty in simplicity of one layer cakes! Thanks for the lovely reminder! I’m vaguely obsessed with brown butter lately so that frosting needs to happen in my life…though there is a danger I”d just eat the whole batch. 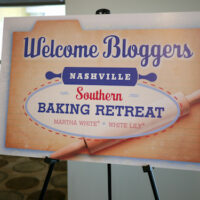 Oooh I have never tried browned butter icing, that sounds heavenly! that icing sounds great, yes! sometimes icing makes the cake, agree?! This recipe looks really good. I can’t wait ti give it a try. First off, I love the swirl on the top! It’s one of my favorite simple designs. Secondly (and most importantly), I have got to try this recipe, it looks and sounds delicious! This cake was delicious! I was on a hunt for a perfect browned butter recipe, I made this yesterday and it was amazing! I used just vanilla extract instead of the vanilla beans, and it was still perfectly yummy. Thanks for the recipe! 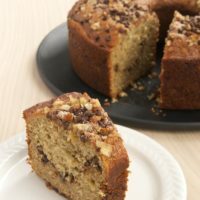 This cake seems a simple and warm delight to make for a desert. 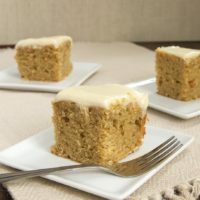 The butter icing is perfect with the vanilla flavoring of the cake. And yes, straining brown butter is the ideal way to go. It’s a nice desert. I want to try this soon. I’ve tried a few of your recipes, all keepers. 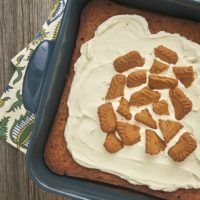 I used this recipe with amaretto instead of vanilla, and frosted with Italian buttercream for a wedding, it got rave reviews! thanks! My co-worker gave me a vanilla bean for Christmas and I had been wondering what to do with it. I finally made this cake yesterday and it is incredible! I now want to make EVERYTHING with browned butter! Mmmmm, your brown brown brownies or the chocolate chip hazelnut brown butter blondies are begging to be made and devoured! I just baked it tonight (did not do the frosting). It’s delicious! Mine was a bit on the crumbly side, and I am guessing it needs to stay in the oven for a few minutes less. Lovely recipe, thank you!